A flash flood in D.C. Sunday night brought massive flooding, submerging cars and trapping people inside. Now a city councilmember is calling for relief for the victims of the flooding. WASHINGTON – A flash flood in D.C. Sunday night brought massive flooding, submerged cars and trapped people inside. Now, a city council member is calling for relief for the victims of the flooding. 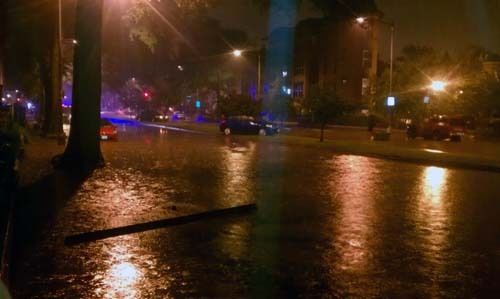 Flooding was reported in the Bloomingdale, Adams Morgan and Mount Pleasant neighborhoods of Northwest, and a motorist was rescued from a car that stalled amid high water on Rhode Island Avenue. Kenyan McDuffie, D-Ward 5, is calling for the city to establish a relief fund to compensate victims. McDuffie asks residents show legitimate flood damage as a result of the flooding, as well as the three previous storms. D.C. Fire responded to the initial reports of people trapped in their vehicles in the Bloomingdale neighborhood around 8:30 p.m. Most were able to get out of their cars on their own. The Washington Post reports that 3 to 5 inches of rain had fallen at the Children’s National Medical Center in northwest Washington by 9 p.m., while at least 2 inches had fallen on the city from the Capitol to American University. Gable managed to move his Nissan Versa to a median to avoid submersion. Another resident wasn’t so lucky. Anne Murphy’s red Toyota Prius was a victim of the flooding. “We couldn’t even turn it on. We sort of had to pry open the door to get in,” Murphy says. At least three Metro stations in Northwest experienced some flooding, and Metro had to suspend service on the Green Line near the Shaw-Howard University Metro Station. Storms have been dumping rain on the area since Saturday. Forecasters attributed the stormy weather to the remnants of Isaac, and said the Mid-Atlantic region would continue to feel the effects into Wednesday. WTOP’s Thomas Warren and Rob Woodfork contributed to this report.